Restaurant Le Fes is one out of three restaurants at Eden Andalou Spa & Resort outside Marrakech. It served traditional Moroccan cuisine and was the obvious choice for us when staying at the hotel. Le Fes is located at Eden Andalou Spa & Resort, 9 km (5,5 miles) outside Marrakech. In order to dine here you'll need a car or a taxi may bring you to the restaurant for 150 dirhams (13,35 EUR). The hotel is located on beautifully developed grounds but has, sadly, no windows facing the exterior. The staff at Le Fes provided service with a smile. Most of those working there were young, and obviously not trained enough. Sometimes we were given service at once, other times we had to wait, but we did not care much - we were on holiday, and were not in a hurry. Here is a short (a little dark) film clip from Le Fes posted on my YouTube account. 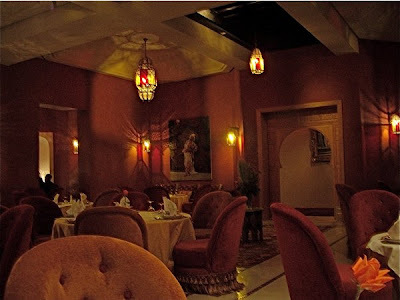 The interior at Le Fes was dark, mysterious in deep red with velvet chairs, round tables with white tablecloths. A little dated, in European terms, but unusual and exciting as a restaurant on another continent should be. Tables were elegantly set with cutlery, wine glasses, napkins and china. We were placed with good distance each other, leaving enough space for us to feel comfortable. I found the chairs a little low and uncomfortable for dining. It was live music every night we dined here during our stay. Food served at Le Fes is definitely recommendable. All dishes is moderately or cheaply priced (15-25 EUR for a main course) after European standards, but expensive compared to restaurants in Marrakech. I found price of wine a little steep (10 EUR and up for 1/2 bottles). The tagines are a wide variety of dishes named after the rustic terracotta pot they are prepared in. They are often found cooking over open fire. 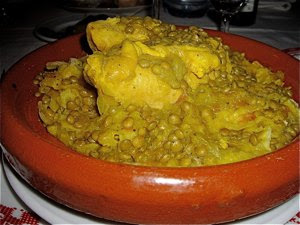 This was prepared with preserved lemon, a North African specialty. It was presented beautifully in its rustic pottery, and cooked perfect, deliciously tender but still succulent. 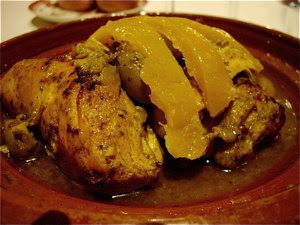 It was one of the milder tagines we ate, served with large slices of preserved lemon on top. I found the large slices of lemon a little overpowering for the pallet, compared to the other seasoning. Smaller quantities of the stuff, mixed in with the other ingredients, may work better. As the menu was in French only, this is my interpretation of the title. Quails or not, there were small birds involved, served with couscous, small pancakes and green peas or green lentils. Nicely presented, served in a rustic terracotta pot according to tradition. Interesting texture, deliciously tender meat, sticky and very rich crepes submerge in the couscous. Very rich dish, and one half of the portion would have been more than enough. Mild, (and a little bland) in taste. 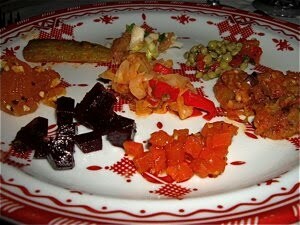 Try the Moroccan buffet, when staying at Eden Andalou. It gives you a very good idea on the wide range of dishes found in Moroccan cuisine. Here you find meat and fish tagines, couscous, small bowls with "mezzeh", soups, pastry and fruit with a wide range of flavours from strong to mild, salty, beautifully perfumed to the ultimately sweet pastries. My favourite? Definitely the hot'n spicy tagine with tomato, sausage, and eggs. Try the harira soup as well, and do enjoy the spoonfuls with a date - a very interesting combination of tastes. Morocco is an Muslim country. In spite of this, it has a considerable domestic production of wine and even beer. Most of the wines on the menu at Le Fes were Moroccan. We decided to try Morrocan wines. 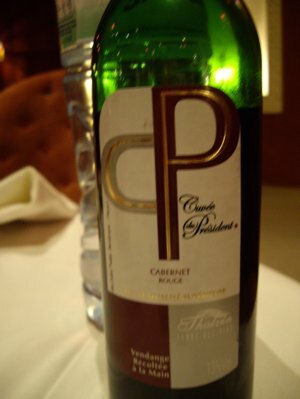 Cuvée de President is a wine found on many menus in Morocco. It is made from Cabernet by Domaine des Ouled Thaleb in Benslimane, (arabic: بن سليمان‎) a town between Casablanca and Rabat. You had to pay around €10 for one 1/2 bottle. Overpriced, considering the quality. I am not very fond of wines made from Cabernet grapes. This was definitely the case with the Cuvée de President. Too much fruit, citrus flavours even. No my cup of tea (or glass of wine). 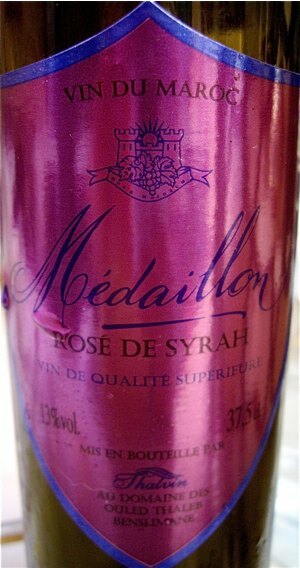 Medaillon de Syrah is found as rosé as well as red wine. It is produced by the same firm as the Cuvée de President. Wines made from Syrah grapes are very different from those made from Cabernet. I am happy to say that this was the case with the Medaillon. The Medaillon was priced a little higher than the Cuvée de President (€13), and it was worth paying a little more. This was a very different, and better wine, much fruit but enhanced by extra body and character. A decent Moroccan restaurant located at Eden Andalou Resort & Hotel. Located 9 km (5,5 miles) outside the city, it is not the most obvious choice for an evening dinner for travelers to Marrakech. For guests a good alternative to try Moroccan cuisine. Good service, good food, nice (but a little unprofessional) staff. Price of food on the upper level compared to food served in Marrakech itself.